Medical-level Microdermabrasion leaves the skin soft and renewed, with more even pigmentation, increased tone and a youthful glow. Excellent for both active acne and acne scarring, this treatment can also minimize sun damage and decrease hyperpigmentation and discoloration. Microdermabrasion can be performed on any area of the face or body. New collagen production will result, providing both immediate and long-term results. We are so confident in our method of treatment and our equipment, that we guarantee our results. All facial treatments include the neck and eye area. Blue Water Spa co-owner Kile Law worked with the Italian inventors of microdermabrasion to develop the protocol that is used today in medical offices everywhere. Kile literally “wrote the book” on medical microdermabrasion and her clinical manual has been translated into six languages and distributed worldwide. She worked on the FDA studies for microdermabrasion. This procedure received an FDA clearance in 1997. Our aestheticians have been personally trained by Kile to ensure the very best treatments possible. 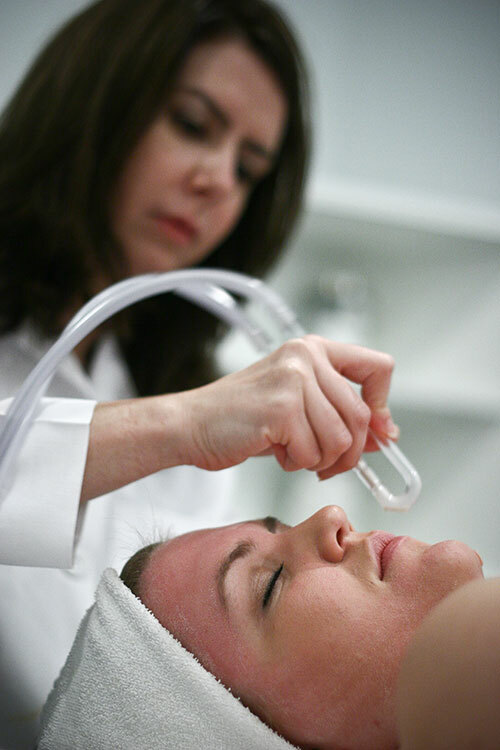 Microdermabrasion, like most skin care treatments is very technique dependent. Great results come from well trained skin care professionals using the best technology, medical grade crystals and the finest skin care products and serums. Microdermabrasion is a nonsurgical, noninvasive procedure that offers safe and controlled removal of the outer, dead layers of the skin. The remaining skin is more smooth, fresh and rejuvenated. Microdermabrasion, sometimes called Particle Skin Resurfacing is achieved using a highly controlled spray of fine medical grade aluminum oxide crystals, (one hundred microns in size), under pressure and vacuum. Debris and used crystals are simultaneously vacuumed into a sealed waste container and disposed. These crystals literally “erase” the imperfections and sun damage, without damaging the skin’s integrity. The result: a smoother, more youthful appearance. Afterwards, your skin will feel very smooth and very clean. You may feel as though you have a mild windburn. But, the treatment is not painful. Our aestheticians will apply a hydrating, soothing serum followed by chemical free sunblock. If you desire, they will also apply mineral makeup which will not clog pores or cause irritation of any kind. Microdermabrasion is performed in approximately 30 to 45 minutes and is a very comfortable treatment. It may stand alone as a treatment method, or it may be used to complement your home care regimen of skin care products. Microdermabrasion can be performed on any area of the face or body. We regularly perform microdermabrasion on the face neck, chest, back hands and arms.